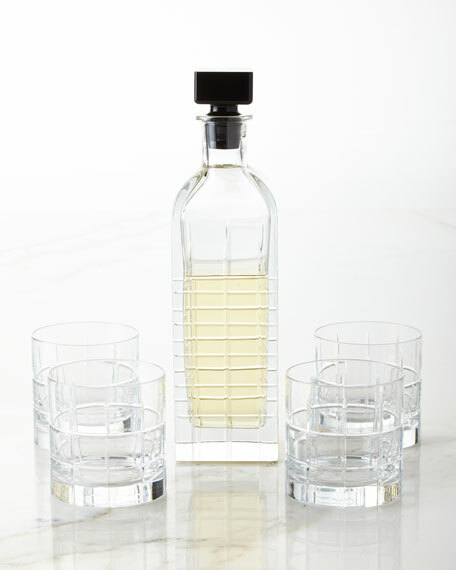 Five-piece set includes crystal decanter and four double old-fashioned glasses. Decanter: 3.1"Sq. x 6.5"H; 35.1 ounce capacity. Double old-fashioneds: 3.4"Dia. x 3.5"H; 13 ounce capacity. The hand-cut grid pattern of STREET suggests Manhattan's famous street network, while the symmetrical decor lends an outspokenly masculine air to the series as a whole. The ever popular Street collection is designed by Jan Johansson. Mouth-blown decanter with laurel engraving. Nickel rose topper. 8"Dia. x 12"T. Hand wash. Imported. Glass decanter. Mirrored circle antiqued glass and iron topper. 6"W x 3"D x 13"T. Hand wash. Imported. Glass decanter. Wood cross topper. Iron coaster. Hand wash. 5"W x 3"D x 14"T. Imported. Handcrafted decanter. Mouth-blown crystal. 6.75"T; holds 32 ounces. Hand wash with mild detergent. Imported.